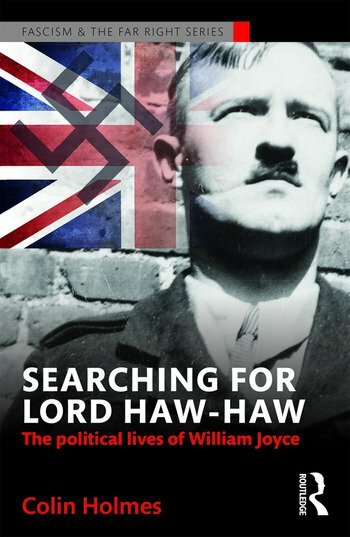 Searching for Lord Haw-Haw is an authoritative account of the political lives of William Joyce. He became notorious as a fascist, an anti-Semite and then as a Second World War traitor when, assuming the persona of Lord Haw-Haw, he acted as a radio propagandist for the Nazis. It is an endlessly compelling story of simmering hope, intense frustration, renewed anticipation and ultimately catastrophic failure. This fully-referenced work is the first attempt to place Joyce at the centre of the turbulent, traumatic and influential events through which he lived. It challenges existing biographies, which have reflected not only Joyce’s frequent calculated deceptions but also the suspect claims advanced by his family, friends and apologists. By exploring his rampant, increasingly influential narcissism it also offers a pioneering analysis of Joyce’s personality and exposes its dangerous, destructive consequences. "What a saga my life would make!" Joyce wrote from prison just before his execution. Few would disagree with him. Colin Holmes is Emeritus Professor of History at the University of Sheffield, UK. He is an acknowledged authority on anti-Semitism, Fascism and Racism in Britain, and has written widely on these themes. His major publications include Anti-Semitism in British Society 1876–1939, a "pathbreaking" study of Jew-hatred; John Bull’s Island, widely regarded as the pioneering analysis of migration into Britain; and A Tolerant Country? a "challenging and illuminating" study of British responses to immigration. Until recently he was joint-editor of Immigrants and Minorities, which he co-founded in 1981. Searching for Lord Haw-Haw reflects these long-standing research interests and represents his first foray into political biography. "The definitive Joyce biography...Searching for Lord Haw-Haw is not merely painstakingly researched. It is composed in a lively style that carries the reader effortlessly from first page till last. It is, in short, a scholastic triumph." Geoffrey Alderman, The Jewish Chronicle. "Colin Holmes, in writing this comprehensive biography of Joyce, has produced a compelling and revealing narrative. After meticulous research and correcting inaccuracies in previous biographies, he provides an engagingly written and fascinating insight into the rise of the fascist movement in Britain." John Green, The Morning Star. "This admirable book enlightens and enthrals us. Holmes has delved thoroughly into all available resources…[and] all this research has contributed to providing a rounded picture of Joyce’s career which gets closer to an understanding of Joyce than all previous commentators…..One [other] thing stands out in this book: it is vastly entertaining. Holmes has a rare and robust turn of phrase." Professor Richard Griffiths, Standpoint Magazine. "Colin Holmes, Professor Emeritus of History at Sheffield University, is one of the leading British experts on fascism and anti-Semitism, and he has been working on a political biography of William Joyce for some time. The very detailed source notes in this book alone make it a definitive account and it is evident that his contextual knowledge is vast." "Holmes' book is a triumph on many levels: scholarly, well-researched and erudite, as well as very accessible and fast-paced. It never fails to delight. It reads as a political thriller, a riveting page turner...This is an important book for all anti-fascists, an important tool in helping us to understand and know our enemy." "Holmes's book is packed with research and the references take up almost as many pages as the text. Holmes is a leading authority on British anti-Semitism and this masterly biography will surely be definitive." "Holmes’ book is at once a complex piece of detective work and a psychological study. This intensively researched book is fascinating and valuable for the way the author weaves Joyce’s quest for fame and adulation into the fabric of inter-war Britain." Colin Holmes is an Emeritus Professor of History at the University of Sheffield and a foremost authority on British fascism. Searching for Lord Haw-Haw rests on long and careful research. Holmes has made the case once and for all that Joyce is one of the most odious personalities in the history of fascism and anti-Semitism….This is a perfect cautionary tale for present times." "Holmes brings to the subject a forensic attention to detail, especially the half-truths, the subsequent reinventions and retellings by his friends and enemies, and Joyce's own enormous capacity for deception. This is the historian as detective. This is a very readable and carefully argued biography. It will be the authoritative account of Joyce's life for many years to come." "Holmes wrests control of memory away from the apologists and sympathisers who would have you believe that British fascism was never as extreme as its European counterparts. Holmes dispels such myths with a thorough account of Joyce's life and ideas." "Holmes’s volume can be welcomed not simply as a meticulous biography but also, due to the richness of its contextualization, as a major contribution to the broader study of extremist right-wing politics in Britain during the period from the 1920s to the 1940s." "Holmes engages with many new archival sources and also develops his new reading of Joyce's politics by drawing on some of the latest approaches to analysing fascist ideology. It offers not only the definitive account of Joyce but also a fresh perspective on British fascism in the era of the Second World War. It is a must-read for anyone interested in the history of British fascism." "Holmes has produced an authoritative account of Joyce's life, in the process shedding new light on the events, individuals and groups with which he was associated, in both Britain and Germany. Barring the release of dramatic new material from government files, this biography will not be bettered." "New biographer, History Professor Colin Holmes reveals Haw-Haw as a thoroughly nasty piece of work. He was a bully, a braggart, a wife-beater, a drunk and a lecher, a totally committed Nazi and a Jew-hater." "It is an enjoyable read that uses the life of Joyce to traverse down a number of historical paths, tying together several fields of historical scholarship. Overall an ambitious, yet very accomplished, book." "One of the top historians of Britain’s far right Colin Holmes gives us what will surely be the definitive biography, the product of 20 years’ research, but research worn lightly – his writing is lucid and readable." "Colin Holmes is one of the most prominent historians of anti-Semitism, extremism and fascism. And his book was nearly 20 years in gestation and involved work in archives in UK, Ireland, Russia and Germany, meetings with latter- day supporters of Blackshirt leader Oswald Mosley and discussions with William Joyce’s surviving family."